The Illinois State University chapter of Best Buddies, shown here attending a basketball game, is one of the oldest and most successful chapters in the country. It has been said that a friend is one the nicest things you can have, and one of the best things that you can be. It is with that philosophy that the Illinois State University chapter of nonprofit Best Buddies International has worked for over 29 years to bring people together to form lasting friendships and a more inclusive community. Best Buddies International was founded in 1989 at Georgetown University in Washington, D.C., by Anthony Shriver. The program has grown exponentially from 50 original participants at Georgetown to over 119,000 participants in chapters worldwide. Illinois State University President Larry Dietz stands with chapter president Anya Naumovski, left, and membership coordinator Camilla Czajka, right. Shriver’s mission was to provide individuals with mental or physical disabilities the same treatment and attention given to other groups. These individuals, or “buddies,” are intentionally matched with program volunteers based on similarities in personality, hobbies, and interests. The buddies then spend time with their partner engaging in social activities while also attending chapter organized events. 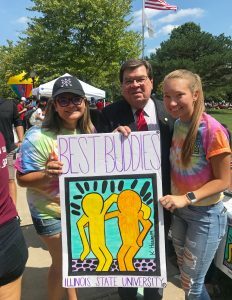 Illinois State University’s chapter of Best Buddies was founded just a year after the original and is one of the oldest chapters in the country. Currently, there are 55 active one-to-one friendships between members and buddies at the University’s chapter. Last fall, chapter members and buddies went bowling at the University’s Bowling and Billiards Center, attended an Illinois State Men’s Basketball game, and wrapped up the semester with a “Snow-Ball Dance” at the Stadium Clubhouse overlooking the field of Hancock Stadium. Illinois State junior and Best Buddies chapter president Anya Naumovski stresses that the program isn’t charity, but rather a volunteer program centered on developing friendships. “Best Buddies isn’t just a great opportunity to get involved on campus and in the community, it’s also an opportunity to make a lifelong friend you might not have met without the program,” Naumovski said. 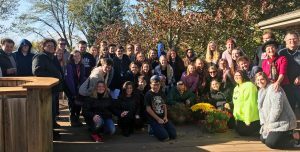 The Illinois State chapter of Best Buddies currently features 55 one-on-one relationships, with events catered to the interests of the buddies involved. Best Buddies is not only facilitating friendships on campus, but also in the Bloomington-Normal community at large. Naumovski emphasizes that she and the other members of Best Buddies are not experts in disability studies, but rather experts in friendship. If you’re interested in joining Best Buddies at Illinois State—or know someone in the community who has an intellectual or developmental disability who would like to join—email isubestbuddies@gmail.com. You can also follow Best Buddies on Instagram.